Over the weekend, the Black Panther box office numbers were already exceeding even the most generous predictions. Disney estimated that their three-day opening weekend was going to be $192 million while the four-day holiday weekend was projected to rake in $218 million. But the Black Panther box office haul has gotten even bigger. The latest Black Panther box office numbers have the movie pulling in $201.8 million for the three-day opening weekend, and the Presidents’ Day holiday total is projected to be $235 million. Those numbers have it shattering records already, and there’s a chance it could pass up some huge blockbusters on the box office charts still. The Hollywood Reporter has the latest numbers. With the new domestic total, the film will still land at the #5 spot on the list of the biggest opening weekends of all time. It’s much further above Avengers: Age of Ultron‘s opening at $191.3 million, but still not enough to pass The Avengers at $207.4 million. However, it could still end up climbing some other charts. 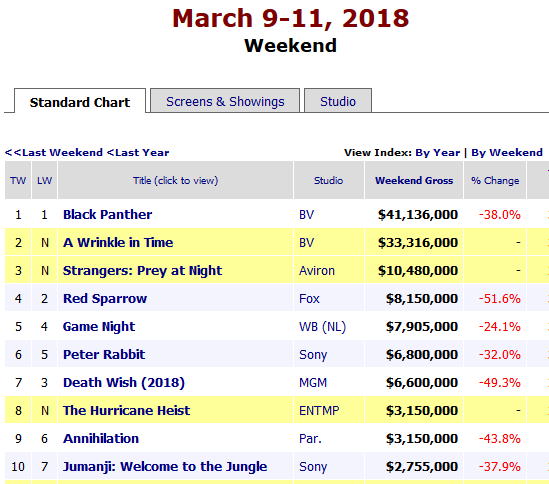 The projected four-day total has Black Panther already passing Jurassic World in the #3 spot for best four-day gross, but if the numbers keep climbing (as rival studios and industry insiders are predicting), it could pass Star Wars: The Last Jedi at #2 with $241.6 million. However, it’s unlikely to top Star Wars: The Force Awakens at #1, with its gargantuan $288.1 million four-day total. La vi ayer con mi novia. Muchísimo mas refinado el humor, los personajes son todos interesantes y en gral te dan muchas ganas de conocer mas historias de Wakanda. el contexto de la peli es muy interesante también porque no esquivan el tema de la cultura afroamericana y la sudafricana.